The Type 001A aircraft carrier embarks on sea trials yesterday. Picture by Xinhua. 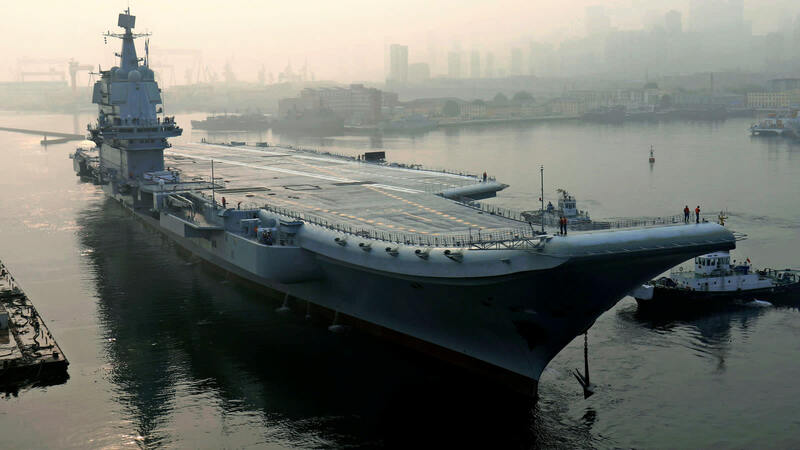 The Chinese have sent the country’s first domestically built aircraft carrier – a flagship for its growing ‘world class’ navy – out for sea trials. The vessel has the temporary name Type 001A and set out yesterday (Sunday, May 13) from Dalian after President Xi Jinping announced the creation of a ‘world-class’ navy. The 50,000-tonne carrier is the first to be wholly built and designed in China, and is set to become the navy’s second aircraft carrier in service by 2020. Currently the country has a retrofitted Soviet-era aircraft carrier called the Liaoning, which was launched in 2012. ALSO READ: How do you solve a problem like Korea? Can US and China sing to the same tune? The new ship is more than 1,000 feet in length and 246 feet wide and uses conventional propulsion as opposed to nuclear. The US remains the country with the most carriers, currently it has 11 nuclear-powered carriers in service. Once China’s latest addition passes sea trials, it will need to be further vetted before it can be declared combat-ready. There is much that can still go wrong during trials, as the UK’s HMS Queen Elizabeth proved last year when a leak left it in need of repair. Although China is far from catching up with the US, its military budget rose by eight per cent this year alone. The Navy’s fleet increased from 210 to 320 ships between 2010 and 2017. American sea power is expected to continue dominating for at least a decade, but China is rapidly catching up. The AG600, the world’s largest amphibious aircraft. Picture by Xinhua. Meanwhile, China expects to deliver its domestically developed AG600, the world’s largest amphibious aircraft, by 2022, the state-run Xinhua news agency reported yesterday. “We are endeavouring to get the airworthiness certification from the civil aviation authorities by 2021, and deliver it to the customers by 2022,” Xinhua quoted Huang Li§ngcai, the plane’s chief designer at state-owned Aviation Industry Corporation of China, as saying. China developed the AG600 as part of a drive to modernise its military, amid a more muscular approach to territorial disputes in places like the South China Sea. As we previously reported, it made its maiden flight in China in December. Huang also said the aircraft would make more flights this year, including its first takeoff from water. AVIC has spent about eight years developing the aircraft, which is roughly the size of a Boeing 737 and is designed to carry out marine rescues and battle forest fires. It has a range of up to 2,800 miles and is designed to be able to take off and land in six-foot waves. Powered by four turboprop engines, the AG600 can carry 50 people, and can scoop up 12 metric tons of water in 20 seconds for fire fighting. In December, state media said that the aircraft had received 17 orders so far from Chinese government departments and Chinese companies.